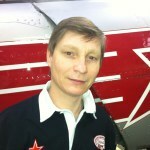 Jez Hopkinson FRAeS is the owner of the Yakovlevs Display Team and has lead the team for over 18 years. 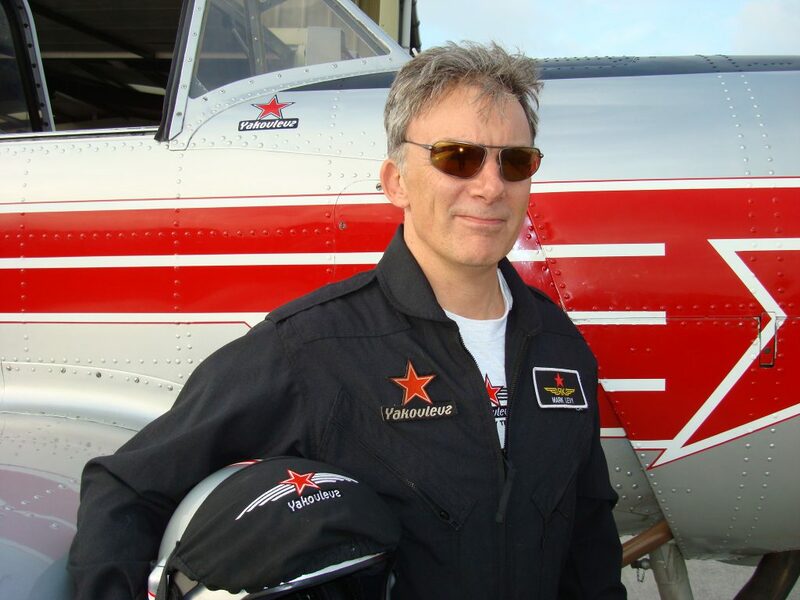 He bought his first Yak 52 in 1994 and with a couple of friends founded the European Yak Club, which quickly grew to include hundreds of members from all over Europe. 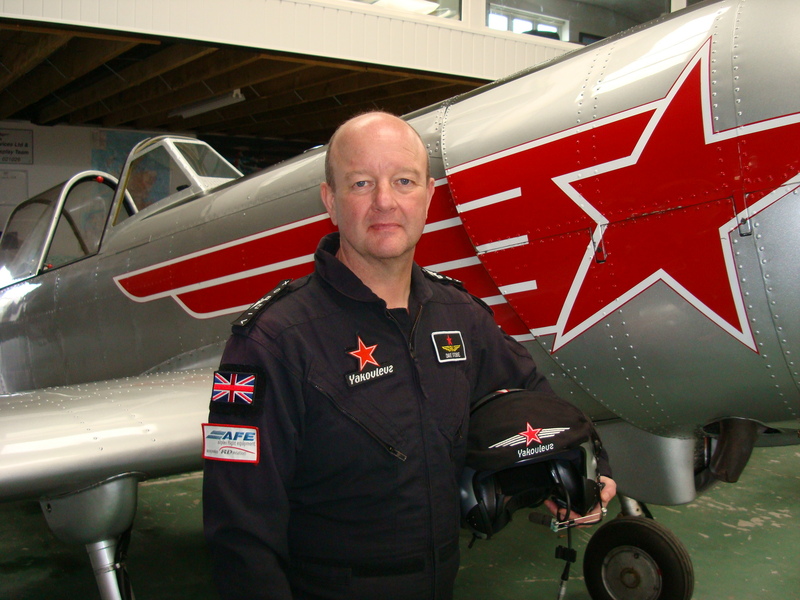 He first set up the Yakovlevs display team in 1998, after buying a Yak 50. He says the Yakovlevs was a natural next step to take. 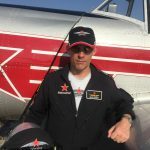 Jez is also an CAA/EASA Examiner and has his own aerobatic flying school since 1995 and now he is very involved with the Air Display world on a formal basis, checking show pilots competency as part of his role as a Display Authorisation Evaluator. When he is not busy examining or running the team, he likes to spend his free time skydiving, snow skiing and scuba diving, but his real passion is actually cooking, with a glass of good wine in his hand. He has been known to dabble in Russian wine making. Jez sits as a member of GASCo, the General Aviation Safety Council, where he is also one of their Regional Safety Officers. He lectures on aviation safety, specialising in flight safety over water and helps run Ditching and Sea Survival Seminars at the RNLI centre in Poole. In November 2014, he was bestowed the prestigious honour of a Fellowship with the Royal Aeronautical Society. Peter Scandrett MA (Hons) Cantab, is a partner in a top London law firm and is based at their Cheltenham office where he specialises in commercial litigation, arbitration and mediation. Peter has always been involved in aviation as he was taken from airbase to airbase with his father who was a RAF Mosquito and Meteor night-fighter pilot. Inspired by his father, Peter started gliding in 1968 in the CCF and soloed in a glider on his first day. He was awarded the Pilot flying scholarship in 1982 and obtained his PPL in the same year at Staverton. He now has Russian and American pilot licences and has held a Display Authorisation allowing him to carry out display flying since 1994. When not airborne in his Bucker Jungmann 131E that he bought and flew back from Spain in 1989 he is flying his Yak 52 that he has had since 1994. 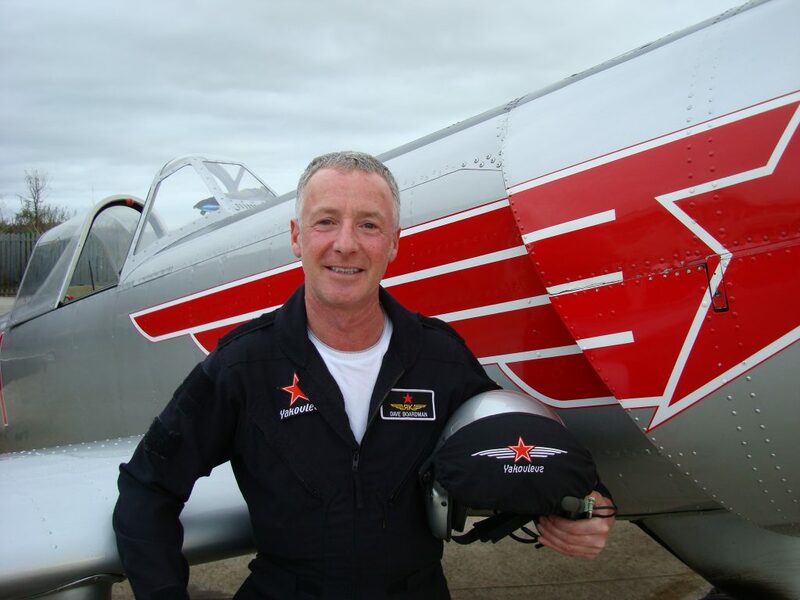 Peter has been flying with the Yakovlevs since 2001 and normally flies in position Yak 3. He has recently moved to position Yak 2 and has flown in more than 200 team displays. Peter splits his time between the UK and New Zealand, where he has a house (on an airfield with his hanger downstairs..) at Pouanui on the Coromandel peninsular. Peter enjoys sailing and riding his BMW motor bike which he takes touring in France, but his real passion is Russian flower arranging. Den Harkin, BA Hons, is a long-haul Captain on the Boeing 777 with British Airways. He started his flying career in 1971 when he joined the RAF and began flying Chipmunks, before moving on to Jet Provost, Gnat and the Hunter. After completing the Jaguar Operational Conversion Unit (OCU), he joined his squadron at RAF Lossimouth, where he flew the aircraft in strike and attack roles before becoming a weapons instructor on the OCU. He met his wife Gill, who was a WRAF officer Air Traffic Controller in the RAF. He married Gill in 1983. Den was chosen as the NATO Exchange Officer to fly F16 Fighting Falcons with the Royal Netherlands Air Force in air defence and attack roles, at the RNAF base Leeuwarden in the north of the Netherlands. After leaving the RAF in 1990, Den joined British Airways flying Tri-Star’s, Boeing 747 and 777, before becoming a captain on the Airbus 319/320 in 2003. He returned to flying the 777 as captain in 2006. He has been flying with the Yakovlevs since 2002, where he flies in position Yak 3, having now flown in more than 60 team displays. 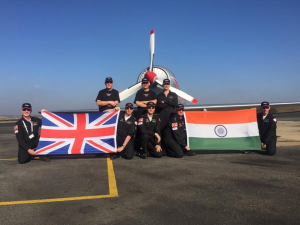 Den and Gill have two grown-up children – James, who has followed in his father’s footsteps and joined the RAF as a pilot, is flying Typhoon aircraft on 1 (fighter) Squadron at RAF Leeming. Their daughter Lucy is at University. During his time in the RAF, Den was captain and manager of the RAF Cresta Run team, competing for many years on the run in St Moritz, Switzerland, where he also developed his love of skiing. His hobbies nowadays include skiing, jogging, rugby, reading and Russian Folk Dancing. Willy Hackett (real name Peter – he picked up his nick name during his RAF fighter pilot training days ) is a veteran combat, display and test pilot who is currently the UK’s national deputy in the F-35 Joint Strike Fighter Program Office – the most expensive military weapons system procurement programme in history. Willy has been displaying with the team since its inception in 1998 and can fly in any formation position. Willy started flying gliders when he was just 11 years old and joined the Royal Air Force aged 18. Amongst many accolades earned during his time with the RAF, Willy was the Royal Air Force’s F3 Tornado display pilot in 1997 and 1998, earning him an MBE in the process. He has also flown F3s during the Gulf war and Bosnian conflict, and then spent three years flying the Harrier Jump Jet before being selected to join the Empire Test Pilot School (ETPS) at MOD Boscombe Down where he spent four years flying the Eurofighter Typhoon as a test pilot. Willy has flown nearly 200 types of aircraft from modern combat aircraft to World War I and II fighter aircraft, although states that the Yak 50 remains his favourite. Willy met his wife Debb in December 1998 and married her in 2004 – the team performed a special display at their wedding. They have two beautiful daughters, Grace and Olivia. Willy and Debb are keen SCUBA divers and are both avid glider pilots. Apart from spending his free time with Debb, Grace and Olivia, Willy also enjoys singing Russian Folk songs. Azat Zaydullin (nicknamed Az) is a Captain on the Boeing 737-400/500 with Ukraine International Airlines. Az had always wanted to be a pilot, so in 1981 he joined the Soviet Air Force in the USSR. After his innitial officer training he was posted to the Ukraine as a pilot to fly the L-39 “Albatross” Jet Trainer Light Attack Aircraft, and later was posted on to the famous Mig 21 “Fishbed”. 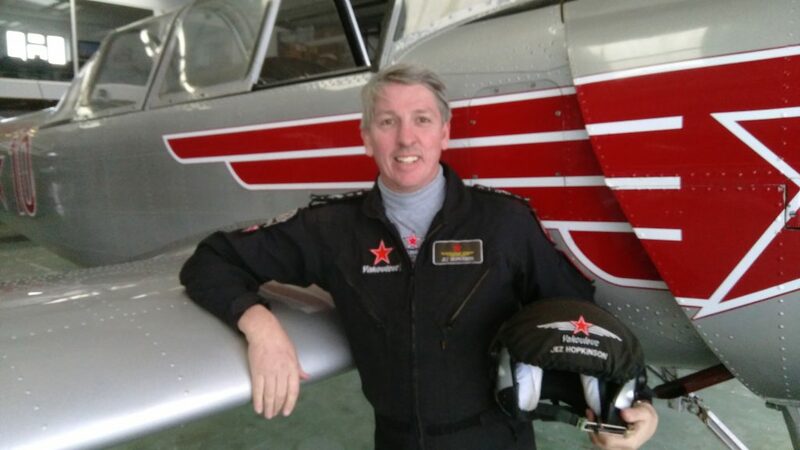 He left the Soviet military in 1987 and became a civilian aerobatics instructor at Kiev in the Ukraine. Az flew competition aerobatics at all levels, and was the unlimited-level Aerobatics Champion of the Ukraine in 1994, 2001 and 2002, flying Sukhoi SU26 and 31. He was a member of Ukraine Aerobatic Team from 1994 to 2002. The team came third in the World Air Games held in Turkey, in 1997. He joined Ukraine International Airlines as a first officer in 2003, flying the Boeing 737-200 and moved on to the 737-400/500, where he was promoted to Captain in 2006. He married his wife Ludmilla in 1997 and they have one son named Timur. Azat started flying with the Yakovlevs in 2001, where he has now flown in more than 200 shows, and has also made more than 600 public appearances around the world. He normally flies at position Yak 4, but also covers the Yak 2 position. Az has recently started to snow ski, and loves to perform Morris Dancing when he finds a spare moment at the team base in Somerset. Jim Schofield FRAeS is a First Officer with British Airways, having recently left the Royal Air Force where his last detachment was Test Pilot on the F35 Joint Strike Fighter. Jim grew up on the airshow circuit and was lucky enough to fly in the back of several warbirds with his father at airshows before legislation precluded such activities – highlights included flying in the back seat of a P-40 Kittyhawk flying to Italy. Jim learned to fly on Super Cubs before he could drive and spent his meagre earnings touring in a Citabria from his father’s farm strip. After several happy years on the University of Wales Air Squadron, Jim joined the Royal Air Force in 1996 where he flew the Tucano and Hawk. After flying training he was posted to the Harrier and trained in desert, arctic and maritime environments before flying on operations in Iraq. 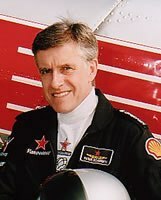 Jim flew more than 70 hours of combat missions over Iraq during the 2003 Gulf War in support of allied Special Forces, and was selected to attend the Empire Test Pilots’ School (ETPS) in 2004 where he won the prestigious McKenna trophy for best all-round pilot. On completion of the course he was posted to the Fast Jet Test Squadron at MOD Boscombe Down, where he was the project pilot for Harrier GR9 during its introduction to service. He also survived 100 hours in the Jaguar more by luck than judgement, and doesn’t miss it. Jim was selected to return to the Empire Test Pilots’ School for an instructional tour as the Principal Tutor Fixed Wing, followed by an F-35 staff job at Air Command. In 2011 Jim became the only non-US pilot flying the F-35 Lightning II during a tour as the MOD’s test pilot at NAS Patuxent River, which culminated in DT-II (Developmental Test Phase Two) where he tested F-35Bs from the USMC aircraft carrier USS Wasp, by day and night. In 2013 Jim was posted back to the UK where he took up the role of F-35 requirements manager. Leaving the RAF in 2016, Jim is currently flying for BA. He has over 5,000 hours on over 85 types. In his top three are the Yak 50, F-35 and Saab Gripen, and in his bottom three are the Jaguar, E-3D Hawkeye and MD520N NOTAR. 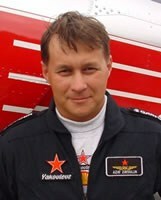 Jim has been flying with The Yakovlevs since 2005 and has performed in over 300 shows. He also flies for the Shuttleworth Collection and readily admits that none of this would be possible without the amazing Lucy, whom he married in 2001 after a whirlwind eight-year romance. They have two fantastic children. Jim is also a keen guitar player although sadly lacking in talent, and enjoys performing and playing Russian hard-core rock music. Dave Stobie started flying gliders at the age of 15 and undertook his first solo on a T21 at 16. The following year he gained his PPL before joining the RAF at the age of 19. After gaining his wings on the Hawk he was posted to the ‘sleepy hollow’ (as he describes it) of Linton-on-Ouse as an instructor on the Jet Provost. Progressing on to front line deployment he flew the mighty F4 Phantom FGR2 during the end of the cold war with 92(East India) Sqn at RAF Wildenrath in Germany. Dave returned to instructing after the closure of Wildenrath at Chivenor as a Tactical Weapons instructor; here he also displayed the Hawk for the ’95 season. This was good preparation for his next tour on the Red Arrows, he says. On the Reds Dave was in the syncro pair for his second and third year, and was fortunate enough to go on tour to Asia and Australia, where the team displayed to 1.3 million people at Sydney Harbour. After the Reds, and with no F4 to go back to, Dave was posted to the Harrier where he spent four years both on the front line and as an instructor on the OCU. In 2003 Dave was selected to attend the test pilots’ course with the prestigious Empire Test Pilot School (ETPS) at Boscombe Down, and on completion moved to the Fast Jet Test Squadron as a Harrier and Jaguar Project Pilot. After two years on the programme he was posted on an exchange to Eglin AFB in Florida to fly the F-16 and here he was involved with all manner of weapons integration testing onto all models of the F-16. 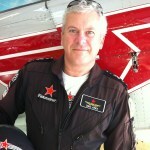 Since returning to the UK in 2009 Dave has been an instructor at ETPS where he flies the Hawk, Alpha Jet and DA-42. 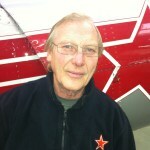 Dave has over 5000 flying hours and has a CPL, is an FI(A) and teaches aerobatics at the local flying club. He has previously competed in UK national aerobatic championships in his Christen Eagle. Dave also has a keen interest in photography, classic cars and cycling. Dave started flying in 1994, completing his PPL at Western Air at Thruxton Airfield in Wiltshire. Switching from the Piper PA28 basic trainer to the T-67M Slingsby Firefly, Dave’s love of aerobatics was soon ignited. He moved onto Yak flying around 15 years ago, first in the two-seat Yak 52 before purchasing a Yak 50 in 2004. 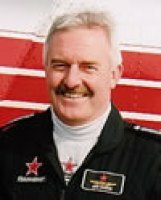 Quickly recognised as a natural and talented formation pilot, Dave then spent 11 seasons flying for renowned display team the Aerostars, managing the team in its entirety for eight years before it disbanded in 2015. Emulating his father’s passion for flying, Dave’s son Alex is currently undergoing training to become an airline pilot. Outside of aviation, Dave’s other passion in life is music as both composer and player. Growing up in Dublin, Dave nearly became a band member with rock legends U2 but, as they say, the music industry’s loss was the aviation world’s gain. Dave is also an expert in the Russian fighting discipline of Sambo. After spells as an air traffic controller and part-time flying instructor, Mark is currently a senior captain with British Airways. He is presently based at London Heathrow flying Boeing 777 worldwide, and has logged over 14,000 flying hours. 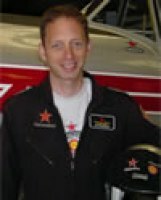 Mark has been a display pilot since 1989 and was one of original founding members of the Aerostars team when it evolved from the Red Star Racing Team. He led the Aerostars until 1999, as well as flying in every position within the team. Mark’s wife is also an airline pilot and they live near Amersham with their two daughters. When not flying, Mark is battling a mid-life crisis by competing in triathlons. He is also an honorary member of the Moscow Nuclear Workers Maxi-Marathon team. 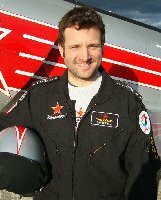 A current easyJet training captain, Phil has in excess of 16 years Yak display flying experience, having been lead pilot for former Yak display team The Aerostars over ten seasons. Phil learned to fly at the age of 16 at Brize Norton whilst completing his school studies. On graduation, Phil travelled to Florida to build flying hours and gain a twin rating, and ended up helping to run a friend’s flying school in Miami for a year. Returning to the UK, Phil gained his flight instructor rating and taught for a short period before gaining his first airline pilot position in 1989 with Air UK. He remained with Air UK for 10 years, four spent as Captain on Fokker 100 aircraft. After 10 years with Air UK, Phil joined Go Airlines, becoming a training Captain on the Boeing 737. His current position is training Captain with easyJet on its Airbus fleet. Outside of the airline industry, Phil started flying a Tiger Moth in 1994. He then purchased a Bucker Jungmann and soon after his beloved Yak 50, which he has now owned for 22 years. Phil is currently teaching his son to fly and when he’s not working for easyJet or flying his Yak 50, he also flies business jets. In the rare moments when he’s not airborne, Phil is learning the Uralic dialect Moksha. Marc-Antoine (Marco) is the latest addition to the team line up. He caught the flying bug at an early age, starting his training aged just 15, before undertaking his first solo soon after his 16th birthday in a Robin HR200. Marco joined the French Air Force in 2005 and became a pilot on the Alpha Jet before progressing to become an aerobatics and formation instructor on the Grob 120-A and TB-30 Epsilon. After seven years in the French Air Force, Marc entered the civilian market, gaining his Air Transport Pilot Licence as well as a civilian instructor rating and taking up a teaching position with Roger Janin Flying Club in Paris. Leaving France, Marco then joined Flight Training London at Elstree Aerodrome. Joining the team early in 2016, Marco has quickly demonstrated his credentials and has been busy spending his inaugural year with the team learning the various formation positions and is now fully qualified for the 2017 season. Marco is a keen trail biker and renowned Svoyi Koziri card player. Dan Denham is a defence consultant carrying out business development for aviation requirements. He is an ex Royal Navy Fleet Air Arm pilot who had a varied military aviation career. He first flew on a gliding scholarship aged 16 and was totally hooked with the flying bug. He started flying training in 1994 and first qualified as a Sea King ‘Junglie’ pilot, serving in Bosnia and Sierra Leone; he also spent a period of time flying the Gazelle AH1, serving in Kosovo. He gained a place on the fast jet crossover course which he successfully completed and went on to fly the Sea Harrier FA2 until its removal from service in 2006. On leaving the Royal Navy, Dan stayed in the defence aviation world and now works as a specialist defence consultant working with the UK Joint Combat Aircraft (F-35) Team. Dan married the gorgeous Jo in May 2006 and has two children; a daughter Isobelle aged 4 and a son called Oliver who is just 18 months old. He therefore does not have any spare time! If he did, he would like to fly more often than he does. Dan joined the team in 2011 and has displayed at various shows both in the UK and the rest of Europe, as well as China in 2012. His hobbies and interests are skiing, sailing, general water sports as well as having a secret passion for Russian cake baking. Etienne Verhellen is an ex Belgium Air force C-130 pilot now working for British Airways as a first Officer on the 747 fleet. 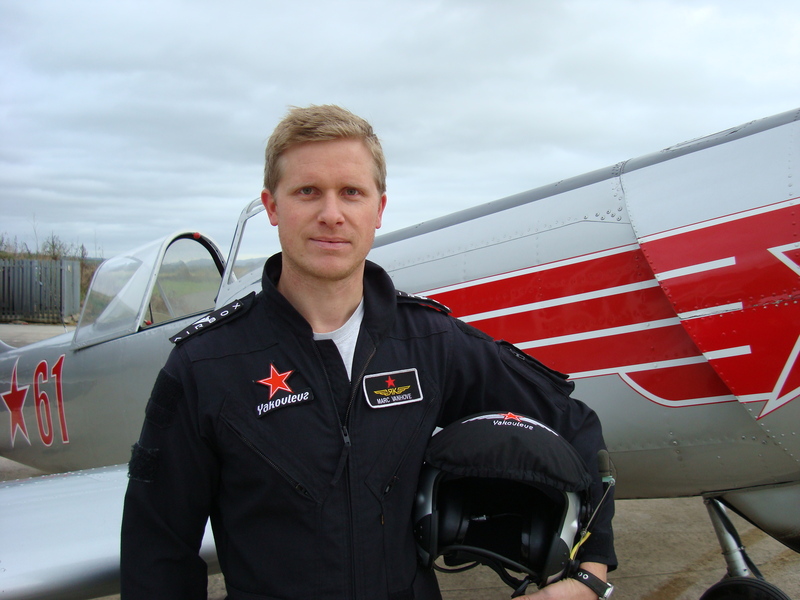 He is a Flight Instructor FI(A) and an Aerobatic Instructor specialising on the Yak-52. Etienne started ‘flying’ as a Reserve Officer (National service) in the Belgiun Parachute Regiment (completing 35 jumps). He then joined the Belgian Royal Air Force as a pilot on a Short Service Commission (SSC) flying the SIAI Marchetti SF-260M, the Dassault/Dornier Alpha Jet AJ-1B and the C-130H Hercules. After his time in the Belgium Air Force, he flew as an Air Taxi pilot on a Piper PA-31 Navajo, did some glider towing and some flight instructing before joining European Air Transport as a ‘Freight Dog’initially flying the Convair CV-580 followed by 5 years as a skipper on the Boeing 727-100 and 200 Series for DHL. In 2007 he joined British Airways flying the ‘Classic’ Boeing 747-100 and 200 Series, but moved on to the more modern and iconic Boeing 747-400 Jumbo Jet when the Classic fleet was retired. 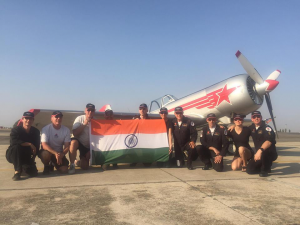 He had the opportunity to take part to the first two Yak World Aerobatic Championships organised by the Fédération Aéronautique Internationale – the first FAI Yak WAC was in 2008 in Novosibirsk, Siberia and the second in July 2009 in Rojunai, Lithuania. When not flying the 747 or Yaks, Etienne treasures time he can spend with his family and friends in the Belgian countryside where he lives. He enjoys gardening, but has a real passion for building Russian Datchas for Datchniks friends. Favourite Display: None as yet… but guessing all of them! Interests: Flying, Flight Training & Examining, travel, good food, growing old gracefully and …. oh yes more flying! Dave Jones (known as ‘DJ’) has had an interest in all things aviation since he was small, having his first introduction to flying at the age of 13. He realised this was for him and after gaining more experience from the ATC he got his pilots license just after his 17th birthday…….Flying before he could even drive! On leaving college he went into retail becoming a national management development manger for a well know high Street company…. but still wanted to fly commercially. He became a flying instructor ending up as Director of flight Operations /CFI at Bristol Flying Centre and teaching instructors to instruct, he became the UK’s CAA’s youngest Flying Instructor Examiner (FIE) at age 30. He left instructing to get into Corporate Aviation – Fixed Wing Training Captain for Air Hanson then onto Police Aviation Services as their Training Captain, during which time he served in the Caribbean working with the DEA/Law Enforcement teams on illegal immigration and anti drugs missions. On his return he attended the short course at the International Test Pilots School (ITPS) at Woodford. His day job is Chief Pilot with a Corporate jet Operation, but still loves the thrill of “Real flying” in the Yaks and Stampe and instructing and examining in his Bulldog. He is a Senior Examiner for the CAA and also a strong advocate of Flight Upset Training for corporate pilots and runs practical courses on it. Married to wonderful Linda who puts up with so much, he has two fantastic grown up daughters Amy and Alexandra (Alex). Hobbies (apart from aviation) are skiing, military badge collecting and restoring and playing antique Russian Balalaikas. 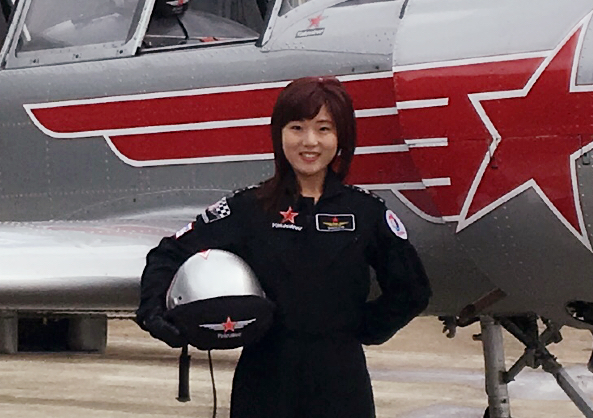 The Yakovlevs would like to extend a warm welcome to new team pilot Sharon (Zhaohuachen) Wang. Sharon is Managing Director of Fly Aviation (Fu Lai), based at Rochester Airport in Kent. Fly Aviation is a flight training school specialising in pilot training in the UK for Chinese nationals. 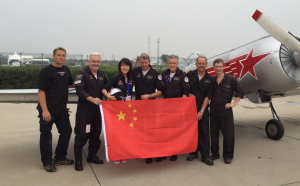 Her operation is high profile, engaging support from both the UK Civil Aviation Authority and the Civil Aviation Administration of China. Dividing her time between London and Beijing, Sharon is a former Ernst & Young auditor, University of British Columbia scholar and charity fundraiser. She is a keen polo player and an expert Cossack acrobatic horse rider. 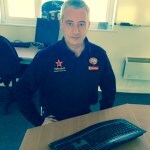 Jeremy Diack is the Yakovlevs’ Operations Director, leading ground support, sales and marketing for the team. 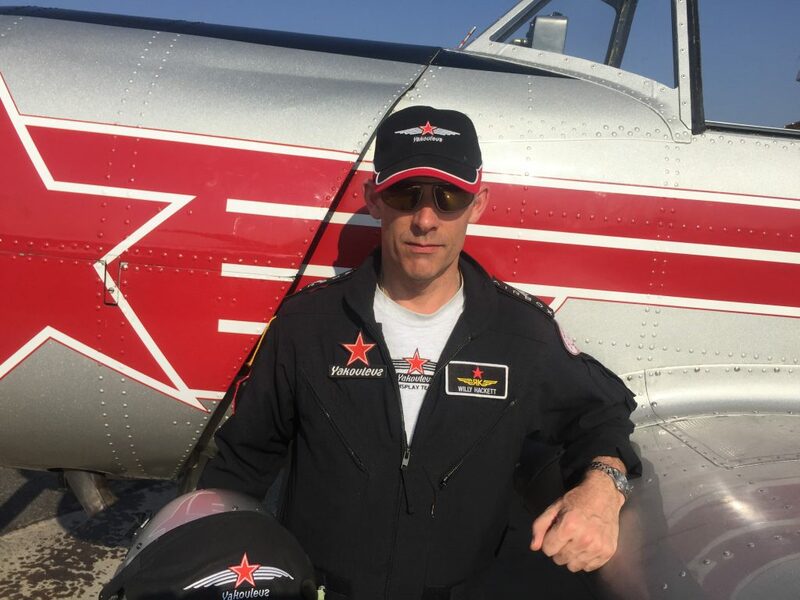 Having recently joined the Yakovlevs from aviation publisher Airplan Flight Equipment (AFE) – an esteemed, long-term sponsor of the team – Jeremy has been indirectly involved with the Yakovlevs since its inception in 1999. He commenced his aviation career at Compton Abbas Airfield in 1996, where he worked as operations manager for the airfield and flying school, before joining AFE in 2001, where he managed their Oxford Airport operation. 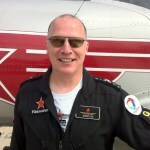 A member of the British Business and General Aviation (BBGA) Professional Flight Training Committee, and Fairplane.org (an initiative to unlock Government financial support for commercial pilot cadets), Jeremy has been editor of aviation industry newspaper Flight Training News for the last 10 years, a position he continues to occupy alongside his activities with the Yakovlevs. Jeremy is an experienced polo player, having played for the Tidworth Royal Artillery, and he continues to keep his hand in with the occasional chukka at his friends’ polo ground near Poole in south Dorset. He is also an accomplished marksman and is the UK’s leading expert on Russian epic ‘byliny’ songs – just don’t ask him to sing for you. Arturas Armonas is a Yak engineer specialist working with Horizon Aircraft Services, the Yakovlevs’ dedicated maintenance company. Arturas hails from Lithuania. A passion for all matters aviation, which saw him building model kites and aircraft from an early age, Arturas commenced his engineering career in 1997 when working at an aero club just outside of Vilnius. Specialising in Yak aircraft, both maintenance and restoration, Arturas relocated to the UK in 2004, finding employment at Russian Engineering at White Waltham Airfield before joining Horizon in January 2014. Arturas is married to Maria and they have two young children, Lucas (6) and Elze (3). In addition to his model aircraft building, Arturas is a keen fisherman and accomplished guitar player, although his current favourite pastime is weaving tweed jackets out of material sourced from the Isle of Harris. Nigel Cross is also a Yak engineer specialist working with Horizon Aircraft Services. Gaining a PPL in 2008, Nigel first met team leader Jez when he conducted his PPL Skills Test, resulting in a first time pass and lasting friendship (we’re assured no monies exchanged hands). He enjoys working with the team and has is a mainstay for them when they travel on overseas deployments. Nigel has three children Ben, Natasha and Emma. Hailing from a small village in picturesque Dorset, Nigel holds the distinction of being the county’s only official Borscht taster.